The story began on July 3rd 2009 with an email enquiry from Michael Pierpoint, a resident of Albuquerque, New Mexico, USA. He gave details of a ‘Chubb Desk’, passed down to him by his grandfather. 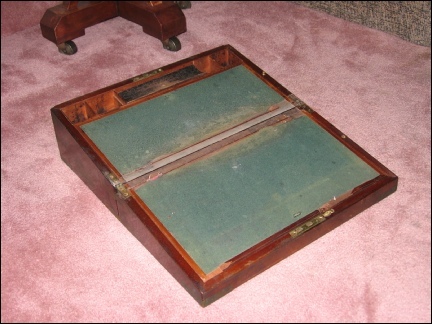 The lid was inlaid with a decorative plate engraved ‘C. Chubb Jun’r 1847’ and inside was a sheathed dagger, inscribed ‘Charles Chubbe – Born 11 Jan’y 1812’. 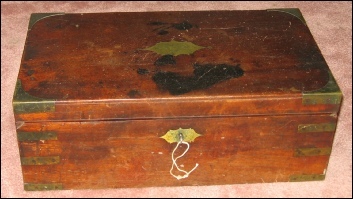 The desk was fitted with a working lock and key - the lock also marked ‘Chubb’. Having no descendants, Michael said he was trying to decide what to do with the desk. He’d considered donating it to a Museum and had looked at the details of The Locksmiths House in Willenhall but as that seemed likely to close down, he wondered if I could provide some advice. I sent him an immediate reply, requesting photographs and asked him to delay any decision regarding disposal as I felt the English descendants of Charles Chubb might be interested. Michael replied saying he’d send pictures in a week or two. Meanwhile, I made contact with Bill Chubb who was very intrigued to hear about this item of family history. Towards the end of July 2009, I received pictures of the desk, dagger and key. The number stamped on the bit and the design of the key (very similar to one shown in the drawing attached to the 1818 Patent), raised my pulse rate! I asked Michael to send pictures of the lock, pointing out the figures on the key might well be the lock serial number and if so, the lock would date to about April 1820. I was also keen to see if the mechanism bore any resemblance to the 1818 Patent. There was a slight delay before I received the picture (shown at the top of this article) that confirmed my assumption about the number on the key bit. I then had to wait a few more days while he tracked down the nearest ‘Locksmith’ because “I have no experience in dismantling/re-assembling locks”. 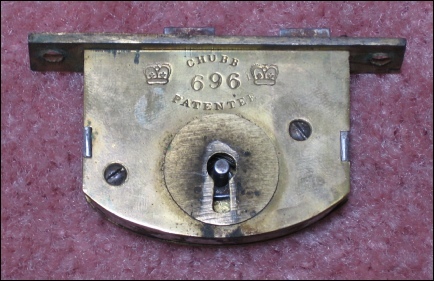 The picture of the lock mechanism arrived a few days later and showed considerable development had been made on the design, drawn and described in Chubb’s first patent. The levers are no longer ‘open gated’ and a comb spring has been introduced. The Detector is ‘L’ shaped and located on the right hand side. 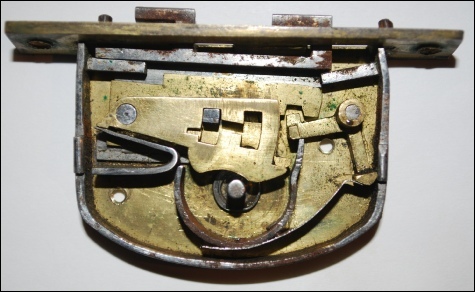 It is obvious that the Detector Spring is broken as the bevelled end that interacts with the Detector can be seen lying at the bottom of the lock case. Both lock bolt supports showed signs of damage (the one on the RH side more than the other) but without being able to examine the lock at first hand it was impossible to know if other damage had occurred. During August 2009, Bill Chubb asked for Michael’s contact details as he wanted to make an offer for the Slope and Dagger. Meanwhile, a good friend offered to check the official Lock Register whilst she was in London on business. The actual entry in the Register forms the title at the top of this page and the dates signify Mr. Brotherton commenced the work on Friday 21st April and completed the job on Tuesday 2nd May. A few months later Bill Chubb told me Michael had accepted the offer and was making arrangements to ship the items to England. Delivery took rather longer than anticipated but they eventually arrived at Bill’s home in Hampshire during February this year (2010). In view of the Slope’s ‘well worn’ condition he decided to arrange it’s renovation and once that was completed, would see about getting the lock repaired. I suggested one of Chubb’s retired Locksmiths, Eddie Bonner, was more than qualified to do this as I knew he specialised in the repair of antique locks. Bill phoned me in May and I set up a meeting with Eddie at his Wolverhampton workshop. So, eleven months after seeing the photographs, this unique lock and key were within touching distance! 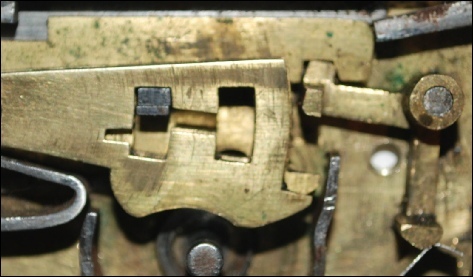 With the lock in front of us, we were relieved to find that except for the damage mentioned above, the mechanism was in it’s original state. Part of the circular steel ward around the drill pin showed some thinning but didn’t prevent the key operating the mechanism. After some discussion it was agreed Eddie would fabricate a new detector spring and carry out a general clean up i.e. minimum restoration. He would also make a Regulating Key plus another to activate the Detector. Top - Original Key. 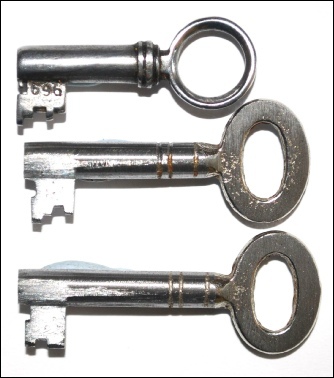 Middle - Regulating Key. Bottom - Key to activate Detector. 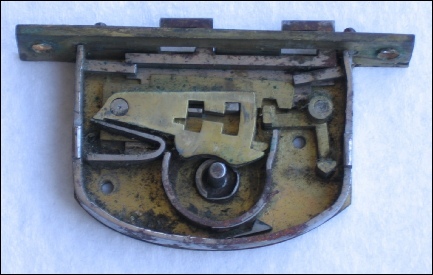 This picture shows a close-up view of the lever mechanism with the Detector set and the separate bolt studs clearly visible. The lower one is attached to the brass regulating bolt. To re-set the detector, the Regulating Key is turned anti-clockwise, lifting the levers to align the narrow slot on each lever with the stud on the regulating bolt and allow it to move left, thereby cancelling the Detector. The renovated lock (and keys) were returned to Bill Chubb on the 1st of July 2010. As yet, there is no definite explanation for the 27 years difference between the year the lock was made and the date engraved on the decorative plate!